The best List of Beaches in Doha, Qatar | Enjoy the sun in Qatar! Are you planning to visit for a holiday or live here? If for holiday, I would suggest you stay in the Inter-Continental or Sheraton Hotel as both these hotels have their own private beach. other wise the list down of the famous beaches in Qatar . A family beach with a 1,350 m seafront just outside Al Khor. To get there, drive to Al Khor on Route 1A. Go through the ‘gates’ and at the next roundabout, turn right – there is a sign saying ‘Al Farkeeh beach’. Follow the road for several hundred meters , past the sign for ‘Marina Scouts Club’, and keep going straight until the next sign for ‘Al Farkeeh’. Turn left and the beach can be seen in the distance. There are play areas, wooden sheds, watchtowers, and other facilities. Just 4.5 km beyond Fuwairit is Al Ghariya beach. On Al Shamal (North) Road, take the Al Ghariya turnoff, follow the tarred road and keep to the right when the road splits. After the Al Ghariya Beach Resort, drive 1.5 km until you reach an abandoned village. The best spot is further north beyond the old Scout Camp. 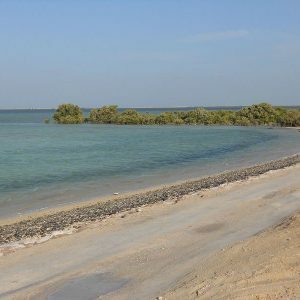 At the northern tip of Qatar, at the end of Al Shamal (North) Road and about 110 km from Doha, are some quiet beach areas with coves and inlets, and picnic and shaded spots. The rock formations are very different in this region and wildlife such as dugongs (an aquatic animal) can be seen. At the Doha Golf Club roundabout, drive to Al Khor on Route 1A for 37 km. Pass through the town and bear left at the northern end of the Corniche, heading towards Al Thakhira. Turn right at the next roundabout; take the first left and pass through the gap between the houses. Heading left away from the village, pass the car park and jetty onto a track across the salt marsh, which eventually leads to a small wadi (desert depression) and then to the beach. At high tide the salt marsh can turn treacherous, so park near the wadi unless in a four‑wheel‑drive vehicle. The old fishing town of Al Wakra is undergoing continuous redevelopment. The 4 km coastline stretches from the hills to the fishing harbour. The beachfront traditional village called Souq Waqif, Al Wakra, will soon be fully open, and is a replica of life 200 years ago. The Al Wakra family beach in the Al Jabal area has volleyball and football areas, shading, showers and toilets. The water is shallow but with lots of rocks, and children should be supervised. Dukhan is on the west coast, 90 km from Doha. The most direct route is via Al Luqta Street past Qatar Foundation, following the signs for Dukhan. At the gates to Dukhan, turn left and follow the coast road for 9 km until you reach Dukhan Water Sports. The tarred road ends here, but to the south there are plenty of places to stop. The beaches are sandy but watch out for sharp rocks under the water. Katara Beach is 1.5 km long and open to members and walk‑in guests. A play area is located by the beach where children can enjoy a variety of activities, games and rides as well as child friendly watersports. As it’s a public beach, women are asked to wear a one-piece swimming costume. Mesaieed is a growing industrial town at the centre of the petrochemical industry, 40 km from Doha. It has some good beaches to the south of the town and this is where the barchans (crescent‑shaped) sand dunes begin. The roundabouts are confusing, but follow the small signs marked ‘Beach’ to navigate to the town’s outskirts and Sealine Beach Resort; dune buggies and quad bikes can be hired here. It is busiest at the weekend and cars, buggies and quad bikes will be driving in all directions on the beach, so exercise caution. Four‑wheel‑drive vehicles are recommended if veering away from the main beach area – select your vehicle’s lowest gear when approaching the softer sand. Refreshments can be purchased at Sealine Beach Resort – there are no other amenities to the south of Mesaieed. Drive through Al Khor and go straight (first exit) over the first roundabout. At the second roundabout, go straight over again (second exit) and immediately take the right turn‑off, at the sign for Dolphin Energy. With the Qatargas/RasGas tower on the right side of the road, go straight for just over 5 km. Turn right at the sign for ‘Flower Each Spring’ and follow the road round to the right – this is an unmade road but suitable for all vehicles. The car park can be seen ahead – park here as cars cannot go any further. ‘Purple’ Island gets its name from the dye extracted from the sea snail (shellfish called thaissavigny), evidence of which can be found all over this coastal stretch of land. The ‘island’ is surrounded by mangroves and is accessed via a causeway (broken away in parts). Climb to the top of the jebel for a 360° view of Al Khor. Coordinates for the car park are 25.41.36N/51.33.16E. The bay is at the tip of a peninsula northeast of Dukhan and is a popular spot for weekend campers and watersports enthusiasts. It can be a rough journey, but if you have a four‑wheel‑drive it’s fun to explore. Follow the newly renovated Dukhan Road, but turn off at the new interchange about 5 km before Dukhan. Pass The Cuban Hospital on the left and onto the road that heads up the northeastern side of the Ras Abrouq peninsula. After 2 km, turn left or right at the Qatar Petroleum site and pipeline. Turn left and you will see an abandoned police post on top of a jebel after 9 km. Go round the hill base and over the causeway on your left to get to the tip of the peninsula. Full of interesting coves, and bays, you may see flamingos in the half-moon bay. If you turn right, you will go past the Ministry of Muncipality and Environment’s SCENR reserve for gazelles and ostriches. If travelling up to Bir Zekreet, it’s worth taking some time going inland and finding the ‘film set’ built into the rock faces of the jebels with small, rough stone buildings where a film was produced several years ago. From here drive up the jebel face – if in a suitable vehicle – and in the distance you will see a small fort. This was used as the location for a TV series, and is open to the public. 80 km from Landmark mall on the Al Shamal (North) Road, look out for interchange exit number 79, as the signpost for Fuwairit is just before the bridge. Come off the road, turn right at this sign and follow the surfaced road leading to a small village. Upon reaching the outskirts of the village, turn left onto a rough track running parallel to the coast. Drive for about a kilometre to get to the beach. From here turn right for the main beach and watch the kite-surfers, or turn left to see the unusual formations of eroded jebel that run down to the water’s edge. Watch out for rocks in the water. 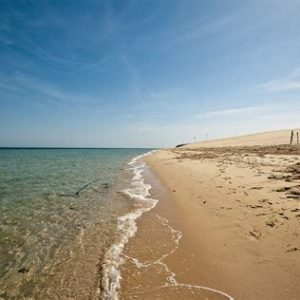 Just 27 km north of Doha is the small village of Simaisma and its family beach. The beach stretches out from a natural jetty, skirts around a small cluster of mangroves and continues around the bend. On the south end is a small hill with a derelict building; a nice silhouette at dusk. Enjoy the mangroves. Learn about the vital role mangroves play in land preservation and try to avoid crushing the mangrove roots. There’s a small cluster of palm trees beside the breakwater that earned the beach its nickname ‘Palm Tree Beach’. From Doha proceed along Salwa Road for 29 km from the Industrial Area, and past the Mukainis satellite earth station. Turn off at the next interchange and follow the road for a further 40 km until you reach the roundabout at the Umm Bab cement works. Go straight across and on cresting a small hill, you will see the coast stretched out below and the distinctive group of trees. The sand is very soft, so proceed with caution. 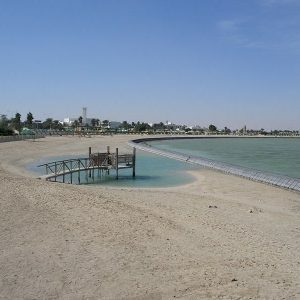 Maroona beach is located 80 km north of Doha.